Alright Autumn, I'm ready for you! You can bring on the chilliness now because I've got a cute, cosy little sweatshirt remake lined up. This started life as a big, stained, unloved and unwanted dude's sweatshirt that we received at work. Usually, if a garment has a stain or mark on it, we'll just use the back and sleeves (if the stain is on the front, of course) and try to match it up with another garment of the same shade to create something new. However, this one was a slightly darker shade of grey marl than most, so I couldn't really see it being used in the usual way so I adopted it for my own ends and took it home to wash out the stain. Happily is washed up well, so once dried it got the scissor treatment. I cut along the side seams and removed the sleeves. I harvested the neck binding and cut along the shoulder seams. I placed my front and back pattern pieces so the bottom edges married up with the lower edge of the ribbing. I also cut the sleeves to retain the cuff ribbing and left the sleeve seam intact. I wanted the new sleeves to be 3/4 length, seeing as I usually yank up longer sleeves on tops anyhow. I took a length of wide lace and applied it to the yoke area of the front piece. I carefully stitched around the edge of the lace, making sure the stitching would fall within the seam allowance of all the edges that would be joined to another piece. 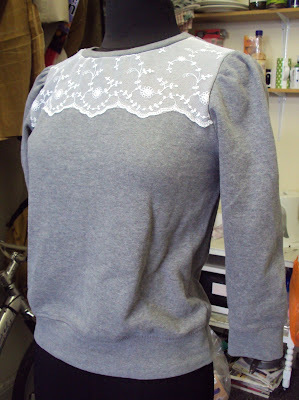 Then I constructed the whole sweatshirt reusing the original neck binding using an overlocker. As you can see, the sleeveheads have a gathered effect by easing in the excess into the armhole as I inserted the sleeves. I'm massively loving this little sweatshirt. I made some navy blue versions for work, but I prefer my grey marl one. I really don't need any more navy blue garments in my wardrobe. Or do I?! Please note that those ones have 1/2 length sleeves (not 3/4 length sleeves like my grey marl one. You're so clever! If I keep sewing for another ten years, I might be up to this type of project. It's lovely. Oh, that is so pretty! Another great idea of yours that I might have to "borrow" one of these days. Well done! This is such a gorgeous refashion - cosy and feminine, you can't get better than that!! I love it. maybe I won't throw away all those old sweatshirts and t shirts belonging my husband! Wow, that is so cute! I might have to harvest something from Hubs' closet. That is sooo cool. I'd love to see you do a photographic tutorial of this one day so we can join in and see how you do it!!! Ps. Where can we buy the ones you have made for work??? LOVE this. adorable. the lace is just perfect! You are so clever!! Everytime you show something new it becomes my favourite! How can you beat this one though, it's an adorable take on vintage and practical. Genius! I love the three quarter sleeves. What a great look and good use of a garment that may have been destined to rag status. I will certainly copy this idea, if you don't mind. 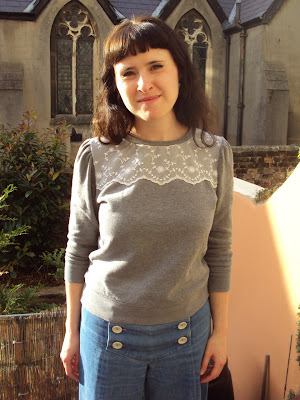 I have done some sweatshirt re-fashioning in the past using battenberg doilies and patchwork. I am always cold and this will be perfect for the upcoming season. Thanks for sharing. This is genius Zoe, I just love it and would love to own one! I really wish I had the same vision for unwanted garments! I am massively loving this remake, too! Gorgeous!! Oooooooh! LOVE! I'm lookin out for a suitable sweatshirt in our local charity shop as of now! Love the addition of the lace, it looks awesome!! I'm not really into refashioning, but your blog has been pulling my attention into it. You're and incredible source of inspiration. ... And this is gorgeous! I love the contrast between sporty and lady-like. Wow, I love the way you have made an average sweatshirt into something so pretty and unique. So inspiring. I would love to have a go at this. Your ideas are fab. Thanks everyone so much for your lovely comments on this remake!!! If it has inspired you to make something similar (or the same!) PLEASE GO FOR IT!!!! And remember to send me the link to your version so I can have a look, it would make me very proud to have inspired a refashion. In love with this! Lace & sweatshirts? Yes!!! I'm a constant sleeve pusher-upper, ruining everything. It makes no sense, as I'm constantly cold, too. Zo!! It is just great & looks super on you. I was so interested in all the details--harvesting the fabric--so useful to know about. I see skirts/dresses every once in a while that I love the fabric not the pattern--all I've ever done w/ them is quilting. You taught me a better way to use them. Thanks! Wow, I've followed your blog for a while now, and I've always been impressed by your refashions, but this one really takes the cake. I love it, it looks ladylike without being too frilly, it's a perfect balance! I Love love love love this sweatshirt! I want one....Oh, you got my creative juices flowing. I love this sweatshirt and am now quite desperate for one in navy!! I am going to keep a look out for a suitable sweater. 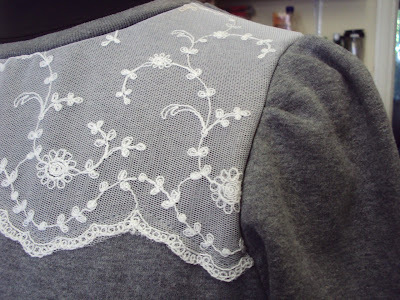 Can you go into a bit more detail of how you attached the top of the lace to the sweater so neatly? SSS '11: Days 29 & 30 THE END!!!! !